Small (6/12 months) - $24.99 Only 1 left! For the longest time, you thought nothing could outshine your love of coffee. After all, it’s the delightful beverage that acts as the lifeblood to your everyday activities. It’s one of the few things worth waking up for! Can you even imagine going through the morning without an injection of that sweet, sweet elixir of the gods into your bloodstream? Of course, then everything changed. Somehow, your little one overtook the place of number one in your heart. With that cute little face, how could you ever love anything more than her? Each and every day, she brings a level of joy into your world that seems unimaginable. Well, what if we told you that you could combine the two things you love most into one? That would be downright crazy… but that’s exactly what this cuddly cappuccino costume does! 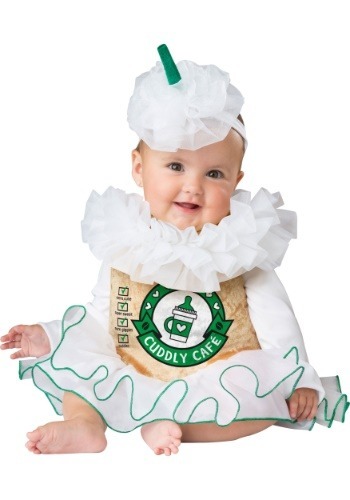 This infant costume turns your baby bundle of joy into a delicious cup of cappuccino! Well, not literally, of course, but it does give her an outfit that looks like a tasty cup of your favorite drink. It has a cute little tutu skirt and the main section looks like a cup from your favorite coffee shop. It even has a frilled collar that makes your little one look totally frothy. The headband also has the same creamy color, but it also has an adorable little stirrer on top. Once your little one has it on, you’ll experience and whole new level of love that you would have never thought possible!